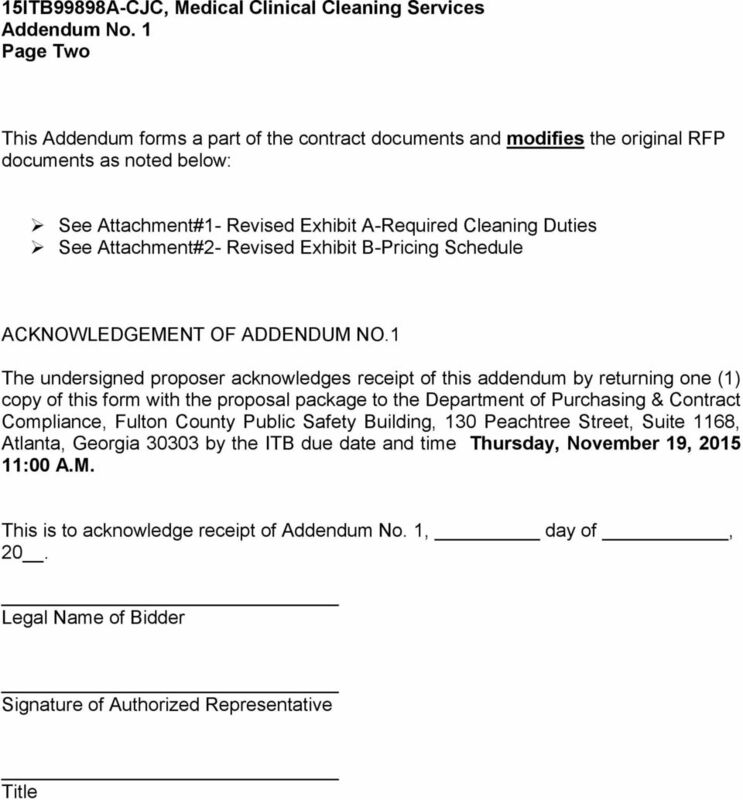 Attached is one (1) copy of Addendum 1, hereby made a part of the above referenced ITB. 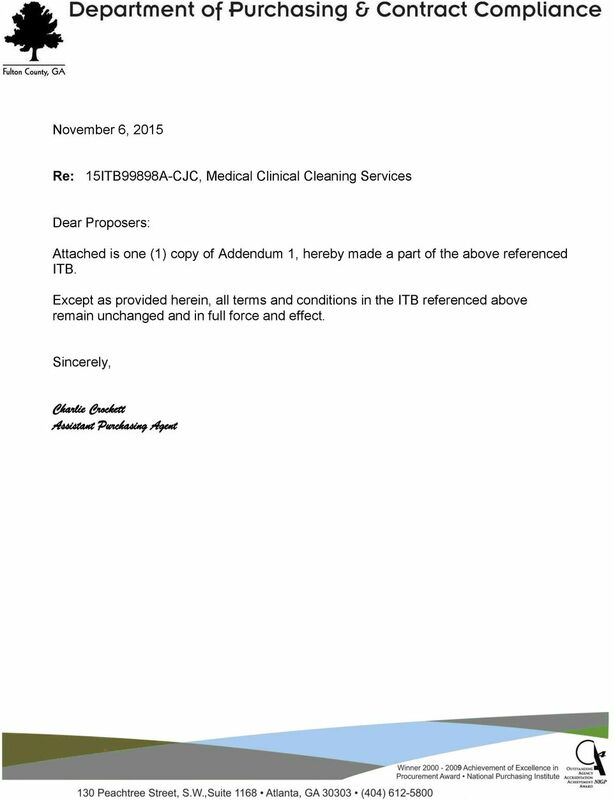 Download "Attached is one (1) copy of Addendum 1, hereby made a part of the above referenced ITB." 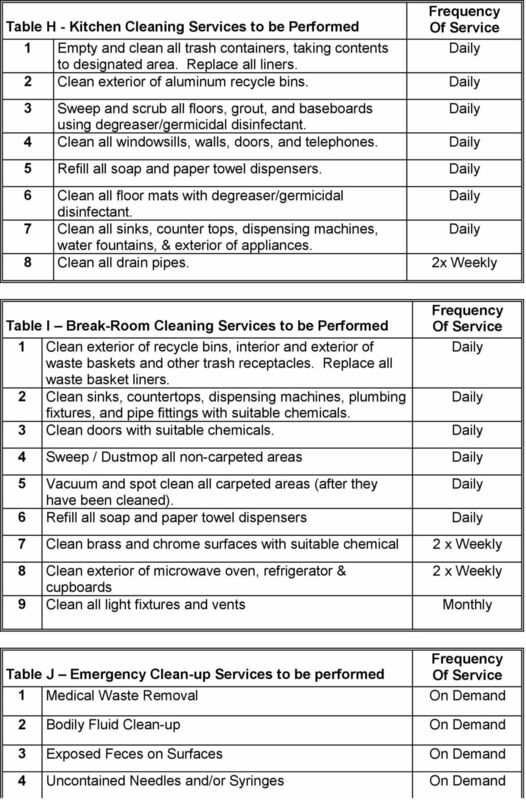 4 Table B - Lavatory, Locker Room and Bath Room Cleaning Services to be Performed 1 Empty wastebaskets and all other trash receptacles, including sanitary napkin dispensers. 2 Clean waste receptacles/replace wastebasket liners. 3 Completely clean areas immediately around toilets and urinals. Clean, disinfect & deodorize all fixtures using high phenol coefficient germicidal cleaner (including showers). 4 Damp clean or polish and refill all dispensers. 5 Sweep and mop all floors using high phenol coefficient germicidal cleaner (including showers). 6 Clean & polish mirrors, bright work and enamel surfaces. 7 Spot clean walls and stall partitions (including showers). 8 Completely wash walls and stall partitions (including showers). 9 Lift all mats and waffle mats inside and outside showers. Clean bottom of mats and floor under mats using high phenol coefficient germicidal cleaner Weekly Weekly 10 Clean all baseboard and floor drain plates. 2 x per Month 11 Machine scrub all floors (including showers). 2 x per Month 12 Vacuum all vents. 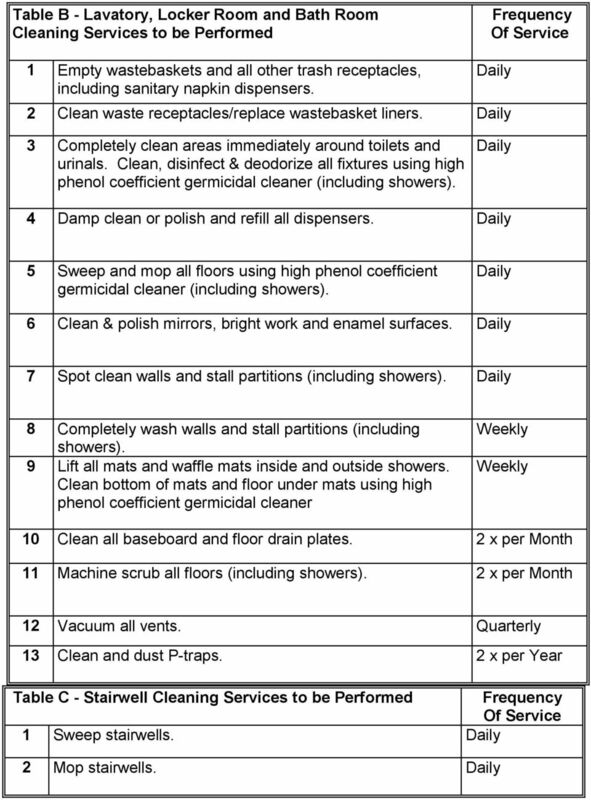 Quarterly 13 Clean and dust P-traps. 2 x per Year Table C - Stairwell Cleaning Services to be Performed 1 Sweep stairwells. 2 Mop stairwells. 5 Table D - Floor Care Services to be Performed 1 Vacuum all carpeted areas including edges, corners, rugs and all floor matting. 2 Sweep and/or dust mop all non-carpeted areas. 3 Mop spillages in non-carpeted areas. 4 Spot clean all carpeted areas (after they have been cleaned). 5 Maintain all hard floor surfaces by means of burnishing, using an approved, non-injurious cleaning solution as well as an Underwriters Laboratory approved floor finish that provides a high degree of slip resistance. 2 x Weekly 6 Strip and refinish all floors. 2 x Yearly 7 Scrub and re-coat all floors. 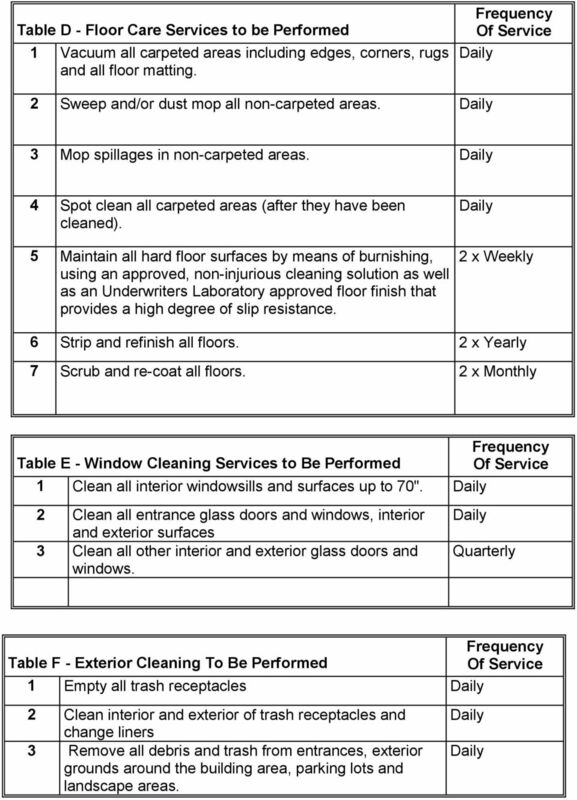 2 x Monthly Table E - Window Cleaning Services to Be Performed 1 Clean all interior windowsills and surfaces up to 70". 2 Clean all entrance glass doors and windows, interior and exterior surfaces 3 Clean all other interior and exterior glass doors and windows. 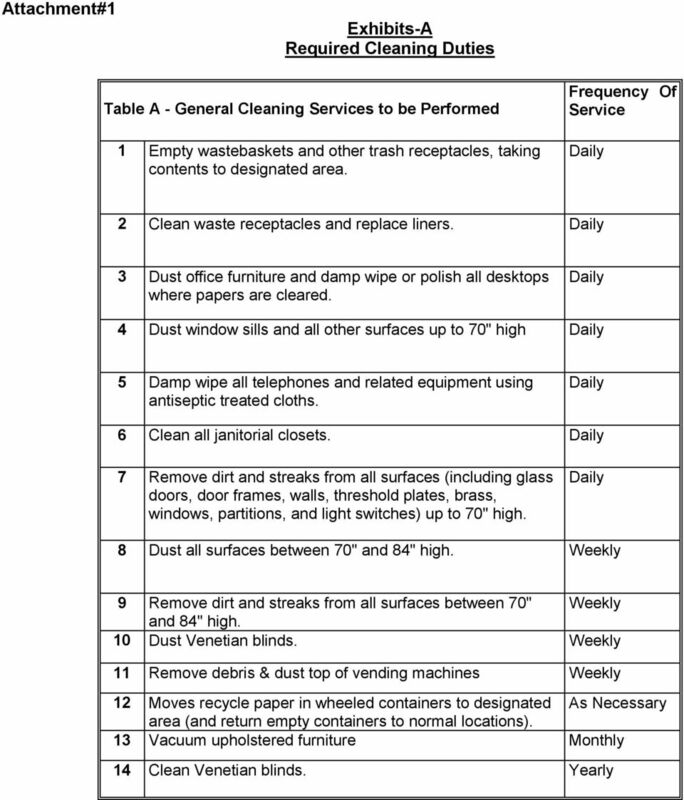 Quarterly Table F - Exterior Cleaning To Be Performed 1 Empty all trash receptacles 2 Clean interior and exterior of trash receptacles and change liners 3 Remove all debris and trash from entrances, exterior grounds around the building area, parking lots and landscape areas. The schedule is based upon a five (5) day work week (Monday through Friday). Weekend service is only when requested. 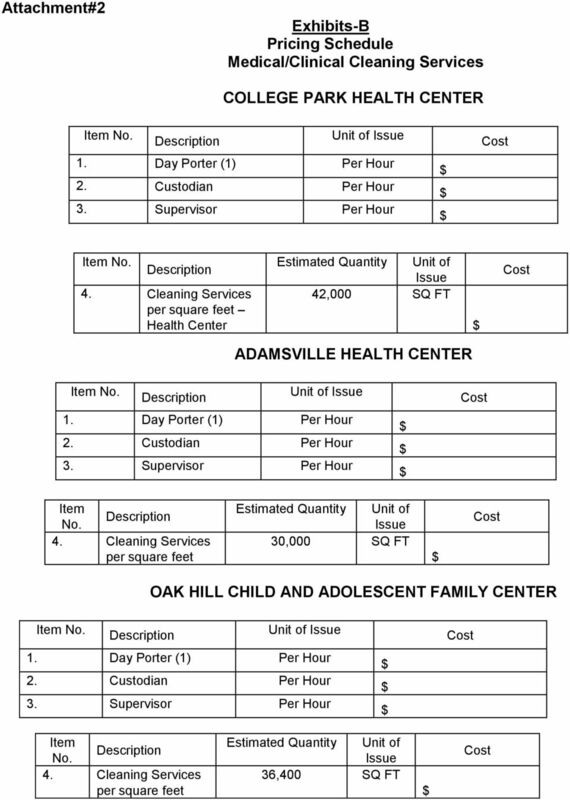 Should you wish to look at the facility or have questions, please contact Jayne Elwell at 239-533-8819. 1. Wash all sinks, urinals, bowls, etc. with a disinfectant/germicidal solution. What to do when bad things happen to good homes. A&A Professional Cleaning Service, Inc.